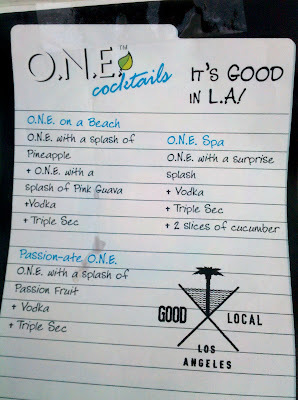 I spent this Saturday at the GOOD LA launch at the Atwater Crossing space in Los Angeles. It was a really fun scene, with local artisans selling crafty things, tons of food samples, free screen printing, artsy activities (like paper crane making), demonstrations, a $5 open bar, and free Grinberg Method massages. I love booths and situations involving many of them, so my boyfriend Andrew and I spent a long time meandering among the various merchants. One whole end of the indoor space was dedicated to fancy food makers and most of them were providing samples. My first reaction was one of excitement - I love samples. One time about a year ago, my mom and I went to the Whole Foods that had just opened near her home in Massachusetts (it's the biggest Whole Foods store in the country, no big deal). She was very proud of it, so we went there on an outing without needing to buy any groceries. I wouldn't have thought life could get any better than wandering around the biggest Whole Foods in the country, but it did: there were sample tables set up at the end of every aisle. We walked directly from one sample table to the next, trying everything. Without a cart or basket, we didn't even have the pretense of actually shopping. It was shameless and awesome. So when I saw the sample tables set up at the GOOD LA launch, my heart swelled with happiness and my tummy swelled with the expectation of being filled with a mish-mash of things that no sane person would ever consume in the same sitting. But then I remembered that I am a vegan. I comforted myself with the thought that my veganism was helping me resist unhealthful temptations. That worked for a while... until I saw the bacon table. Rashida Purifoy owns Cast Iron Gourmet, a company specializing in homemade bacon products. And there were samples. Samples of caramelized bacon chunks, bacon bourbon chutney, bacon mayo pimento cheese spread, and something Rashida called "couch mix," which consisted of dried fruit, nuts, chocolate, and bacon. Anyway, back at the GOOD LA launch, Andrew was enjoying samples of Rashida's bacon concoctions and not trying hard enough to mask his bacon-induced ecstasy. It was pretty yummy and it momentarily distracted me from my bacon cravings. 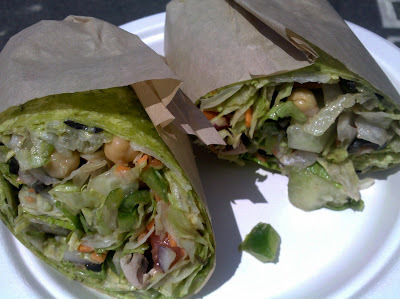 But I couldn't help wistfully thinking, "This veggie wrap would be so much more delicious with bacon. Everything is better with bacon." Then I burst into tears. Just kidding. But I needed to take some action. Did I mention the $5 open bar? It was calling my name. I had just encountered bacon for the first time after breaking up with it, and it was time to drown my sorrows. 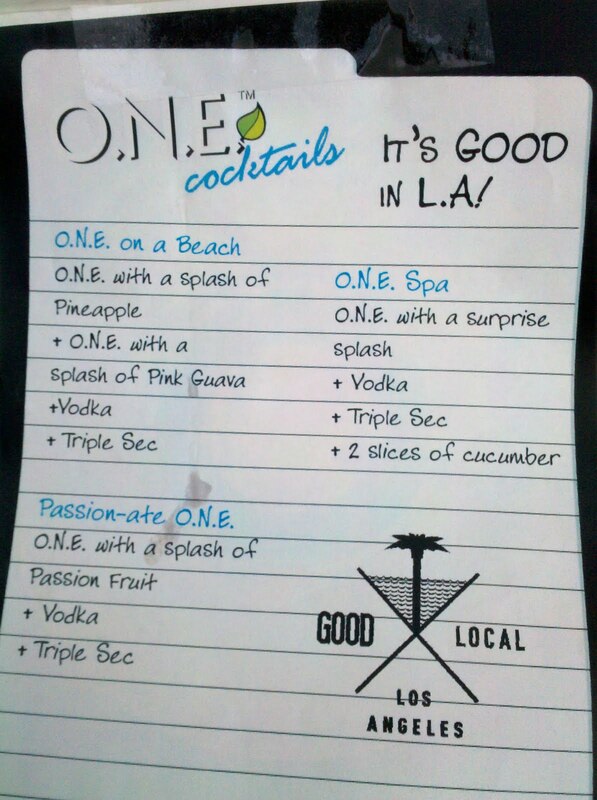 The bar offered all the usual drinks, but I ordered one off the special menu featuring drinks made with O.N.E. coconut water. Who am I kidding? I tried one of each. And it worked. I didn't even think about bacon. Don't worry, you won the break-up. You have a boyfriend, and bacon is still fat.